Lavender Pillow Spray & Refill Also known as Slumber or Sleep Spray to help you to relax and get to sleep. Using a single plant type known especially for its very low camphor, low fragrance but high in plant agents to aid sleep. Lightly spray above the pillow and let the mist gently settle onto the pillow. Do not over spray. Natural Lavender Pillow Spray 100ml . Also known as Slumber Spray or Sleep Spray to help you to relax and go to sleep. 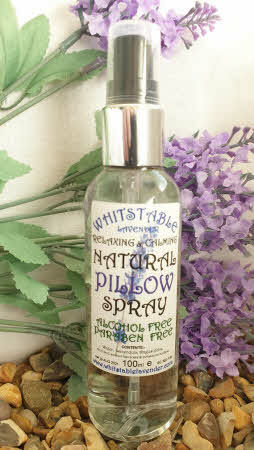 Natural Lavender Pillow Spray 250ml . Also known as Slumber Spray or Sleep Spray to help you to relax and go to sleep. 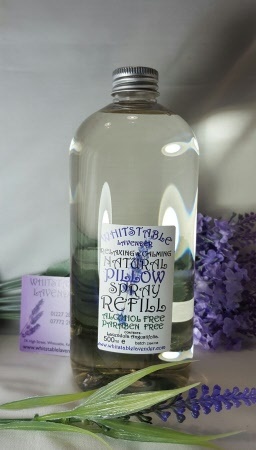 Natural Lavender Pillow Spray Refill 500ml from Whitstable Lavender. Also known as Slumber Spray or Sleep Spray to help you to relax and go to sleep.